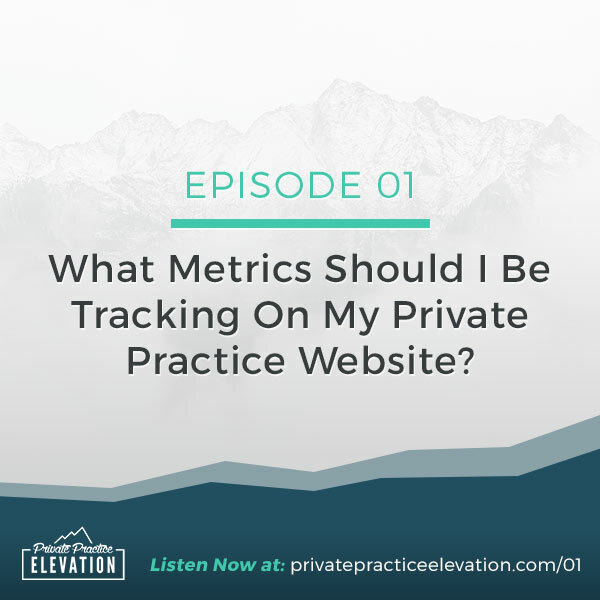 #01: What Metrics Should I Be Tracking On My Private Practice Website? With online marketing, I’ve often heard it said that you can’t grow what you don’t measure. No matter what your business goals are, keeping track of certain metrics, not only pertaining to your website but your entire business, is paramount to moving your practice toward reaching those goals. How will you know you hit a goal unless you actually measure the results of your actions? Metrics and numbers can seem very overwhelming at first. This is especially true if you plug Google Analytics into your website for the first time and take a look at that dashboard. Wow! But I’m not about confusing. I’m about simple here. So I’m going to break down the four most important metrics you should be tracking on your private practice website. While there are many types of metrics you can measure, these will get you started and help you give you a solid pulse on how your website is performing. This episode is brought to you by my free webinar, 7 Steps To Convert More Website Visitors Into Your Ideal Clients. This webinar will give you some simple steps to making some powerful adjustments to your website and content so that you can convert more visitors into you next client. Click here to register! If you’re not yet subscribed to the podcast I want to encourage you to do that today. This is the best way to make sure you don’t miss an episode! Click here to subscribe on iTunes. And if you’re feeling extra generous, I’d love to hear what you think about the podcast. Reviews help others find the podcast plus I’d really love to hear what you think! Click here to leave a review. Just click on “Ratings & Reviews” then “Write a review.” Let me know what you like best about the podcast. Thank you!